This is something I've been meaning to do for a long, long time. But to be honest, I don't tend to have a lot of chicken carcasses lying around very often. After the Zuni roast bird, though, I figured it was now or never. As much as many cookbooks these days say that a nice canned stock is acceptible, whenever I use one I always have this feeling that I'm selling the recipe short. But no more. Although a simple process, making one's own stock certainly feels like a milestone on the way to foodie geekdom. However, I am also fairly sure that I will not always be in a steady supply of whole chickens. Paul Vandewoude, the head chef and resident instructor at Miette Culinary Studio in Greenwich Village (and also the former chef of the now defunct Le Zinc in Tribeca and Tartine and Titou in the West Village) once suggested using the broth from any good wonton soup picked up at the various Asian restaurants around the city. Just have the wontons for a snack, and freeze the broth! 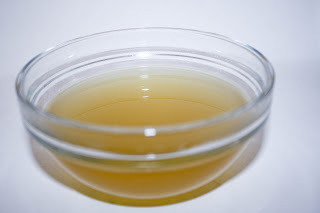 But for my first foray into the world of homemade stocks, I decided to keep it simple and follow Donna Hay's recipe for Basic Chicken Stock in Modern Classics 1. To her basic recipe, I also added 5 sprigs of fresh thyme because, well, it was in my fridge. Preheat the oven to 400, and place the first 4 ingredients in a baking dish. Bake for 1 hour until browned and transfer the contents of the dish to a large stockpot along with the next three ingredients. Bring the mixture to a boil and allow to simmer rapidly uncovered. Reduce the heat to a slow simmer and begin skimming the fat from the surface of the stock so that the liquid remains clear. Simmer for 1 1/2 hours. Add as much salt as you'd like, depending on the stock's ultimate use. Side note: If you're using the stock for soup, you can salt to taste. However, if you're using it for more general cooking purposes, it might be a wise idea to hold back on the salt. You can always add more when you're using it for your recipe. When the stock is finished, strain it into a bowl, allow to cool and then skim any solid fat from the surface. Use immediately, or refrigerate or freeze for longer storage.